Malaysia My Second Home, also known as MM2H, is a programme that allows foreigners who fulfill certain criteria to stay in Malaysia for as long as possible. Under this scheme, successful applicants are given a multiple entry Social Visit Pass, which is initially valid for a period of ten (10) years, and is renewable thereafter. It is open to citizens of all countries recognized by Malaysia regardless of race, religion, gender or age. Applicants are allowed to bring their spouse and unmarried children below the age of 21 as dependents. Citizens from all countries (except for Israel) may apply. Age There is no age limit. Medical Insurance Approved participants and their dependents must possess valid medical insurance coverage that is applicable in Malaysia from any insurance company. However, exemptions may be given for participants who face difficulty in obtaining a medical insurance due to their age or medical condition. Retired applicants are required to show proof of receiving a monthly pension of at least RM10,000 (US$3,100)* from government-approved funds. For certified copies of bank accounts submitted as financial proof, applicants must provide the latest 3 months’ statement with each month’s credit balance of at least the required minimum amount. New applicants who have purchased properties worth at least RM1 million* qualify to place a lower fixed deposit amount upon approval. Successful applicants are required to comply with the following financial criteria upon receipt of the “conditional approval letter” from Immigration Department of Malaysia. Note: After a period of one year, the participant can withdraw up to RM150,000 (US$46,875)* for approved expenses relating to house purchase, education for children in Malaysia and medical costs. Applicant must maintain a minimum balance of RM150,000 (US$46,875) from the second year onwards and throughout his/her stay in Malaysia under this program. Note: After a period of one year, participant who fulfills the fixed deposit criterion can withdraw up to RM50,000 (US$15,625)* for approved expenses relating to house purchase, education for children in Malaysia and medical costs. Participant, however, must maintain a minimum balance of RM100,000 (US$31,250) from the second year onwards and throughout his/her stay in Malaysia under this program. Applicants are allowed to bring dependents under 21 years of age, as well as a maid (domestic helper), from their home country. Dependents above 21 years of age will have to submit a separate application. Application for maid (domestic helper) can be submitted only after the approval of MM2H. Purchase of a property is not a prerequisite for participating in MM2H program. A foreigner may purchase any number of residential properties in Malaysia, subject to the minimum price established for foreigners by the different states. The MM2H participant may purchase one new car made or assembled in Malaysia. He/she will be exempted from paying excise duty and sales tax on the new vehicle. 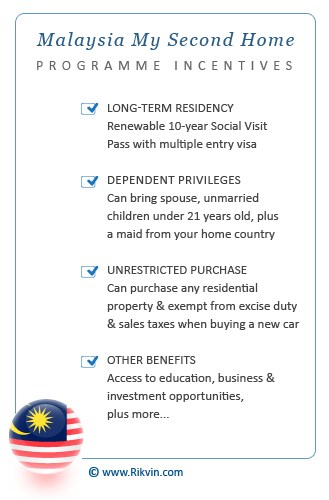 An application to purchase a new car made or assembled in Malaysia must be forwarded to the Ministry of Finance within a period of one year from the endorsement date of Malaysia My Second Home (MM2H) social visit pass. Additional information on purchase of car and procedure will be provided upon request. Participants of Malaysia My Second Home Program are provided with various incentives to make their stay more comfortable and enjoyable in Malaysia. Under this programme, applicants are allowed to bring their unmarried children under 21 years old as their dependents and apply permission to study in Malaysia. Please note that tertiary educational institutions (private colleges and universities), requires their students to have a Student Pass. Therefore, MM2H dependents that are enrolling into tertiary educational institutions are required to terminate their MM2H Social Visit Pass in order to apply for the Student Pass and should be insured throughout their stay under this program. 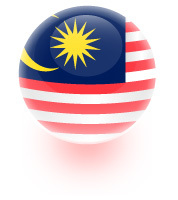 Applicants are not allowed to work under any employment during their stay in Malaysia. However, if applicant invests in certain companies or starts a business, he/she may be permitted to do so subject to approval. Any other form of employment, however, is strictly prohibited. – Interested in applying for the ‘Malaysia My Second Home’ Programme? Contact us at info@rikvin.com for more details.